We are excited to announce the opening of our newest location in the heart of St. Lucie county’s Tradition community at 9401 SW Discovery Way, Port St Lucie, FL 34987. The brand new, 30,000-square-foot state-of-the-art building offers regularly scheduled appointments with our orthopaedic surgeons, as well as physical therapy (PT) and occupational therapy (OT). Dedicated space for sport-specific training and rehabilitation will be overseen by fellowship-trained sports medicine specialists. 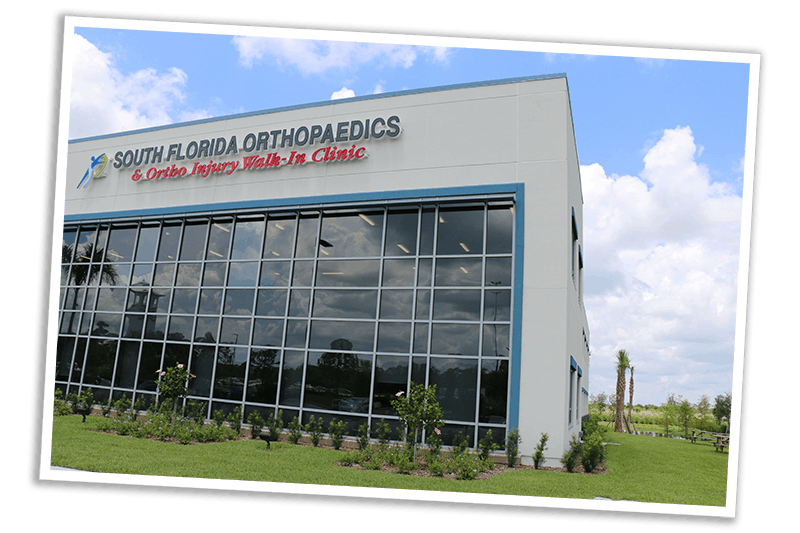 Our Tradition office provides the same level of comprehensive, compassionate orthopaedic and sports medicine care patients can find at our Stuart location in a facility more convenient for residents of the Port St. Lucie and surrounding areas including Okeechobee and Indiantown. Along with scheduled appointments on the second floor of the Tradition office, we are pleased to introduce our new Ortho Injury Walk-in Clinic for treatment of new and acute orthopaedic injuries located on the first floor of our building. No appointment is necessary or required for patients of the Ortho Injury Walk-in Clinic, and the clinic is open extended hours during weekdays as well as Saturdays to make getting in as easy as possible for patients with new and acute injuries. Patients visiting the Walk-in Clinic will avoid E.R. expenses and wait times and see an orthopaedic specialist immediately. All major insurances are accepted. The facility was built by BBL Medical Facilities, a leader in the planning, design and construction of premier medical facilities for more than 40 years. Inside, visitors will find the walls have been decorated with original art from local Tradition-area artists using the Treasure Coast community as their inspiration. I just want to let everyone know what an incredibly awesome orthopedic physician I have found in Dr. Anthony J. Cerminara. I have been his patient since May of 2015 and have received the very best of care. I am also just as blessed to have his Medical Assistant Katy working with him. If you are looking for the best Orthopedic team then don’t look any further. Their knowledge, kindness, compassion and professionalism are a true gift.